Complexity in design isn’t everyone’s cup of tea. Sliders, banners and other web elements can be distracting when all you want is for your readers to focus on your words. Clean, minimalist themes allow your content to shine without unnecessary clutter or bloat. The collection of themes below includes mostly themes put out for free by generous developers on their blogs, as well as free premium themes by larger agencies. Don’t forget to give kudos to the developers/designers if you do decide download and use any of these themes! This article is 100% affiliate-free! We will never take money to promote others, everything you read is genuine. Learn more. Casper is a simple, minimalist theme inspired by the Ghost blogging platform. It features a large fullscreen header and takes advantage of features exclusive to Ghost, such as markdown and the ability to quickly paste links to display images. Tonal offers a greyscale design that changes based on your background color. This theme features large images, full-width videos and makes the most of post formats. Dazzling is a colorful, flat and responsive theme ideal for businesses. It is highly customizable for a free theme, with unlimited color variations, several widget areas, and a flexible featured slider. Untitled has been designed by the theme team at Automattic. It comes with full-bleed featured posts, featured images, a fixed header and subtle CSS3 transitions. This theme also supports a right sidebar. Papaver is a stripped back, minimalist theme that puts the focus on your words. This theme offers one, two or three column variations. Touchfolio is a responsive, sparse design featuring large images. It has a skinning system based on LESS CSS (similar to variables in Twitter Bootstrap) and controls Photoshop file included. It also comes with two types of portfolio – a gallery with list in menu and masonry gallery. Wootique is a free WooThemes design that makes full use of all WooCommerce features. 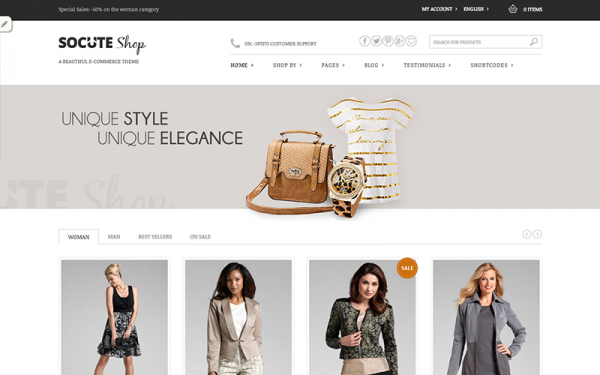 Every WooCommerce widget has been styled to match the design of this theme. It also comes with a featured slider, custom header and widgets and is highly customizable in the backend. Frank provides a light, responsive and unobtrusive reading experience. It is built on HTML5 and CSS3 and features several different homepage layouts. Focused is a responsive, clean theme designed for personal blogs. It features a left sidebar and takes advantage of post formats. White Paper features a light, easy-to-use and laconic design that is ideal for personal blogging. This theme publishes images large, really large. Spacious is a multi-purpose responsive theme perfect for business. It comes with a slider four layouts, six templates, five custom widgets, 13 widget areas, boxed and wide layout, and light and dark skins. Best of all, it features free support – something rare for free themes. Pitch is a non-nonsense business theme that does the basics well. It’s easy to add content with built-in custom post types so you can add slides, clients, projects and features. This theme also comes with a minimal options panel. Expositio is a responsive portfolio theme designed with a big, clean layout for photographers and designers. It features horizontal scrolling and is super easy-to-use. Mystile is a lightweight and responsive WooCommerce theme designed as a canvas you can use as is or as a basis for your own design to match your products. This theme comes with a bevy of options and alternate color schemes. It also features a custom homepage and custom shortcode. The Night Watch is a simple, elegant and responsive theme ideal for personal blogs. It features a large head image and a single column design. Interested in The Night Watch? mnmlist is about as minimalistic as you’re going to get. This theme has been stripped bare to the absolute basics and is free from any distractions from the content. It features a clean, uncluttered design with a minimalist footer and nothing else – no header, sidebar or comments. Less is a fast, minimalist single column design with large text and full-width images. It pulls in the site’s admin Gravatar picture in the header. It doesn’t come with widgets, though it is responsive and has one custom menu in the header. This simple and clean theme is ideal for blogging. It features a responsive design and has been optimized for social sharing. DW Minion supports post formats. Socute is the free version of a premium eCommerce theme designed by YITHEMES. It is highly customizable and features a responsive design and various layout options. Best is a functional, simple theme with a responsive design, page templates and multiple menus. This theme’s built-in layout options allow you to build a simple blog or a fully-fledged business site. It also comes with theming options and shortcode. Sinapp is an ideal theme for promoting a mobile app. It features white-labeled theme administration, a shortcode generator, color skins, MailChimp integration and even free support. Fruitful is a clean theme, featuring both responsive and fixed layouts. It comes with a custom options panel, and key features include dummy content, easy social media sharing, custom heading, menu styling, and a JQuery slider. Moni is a clean, elegant theme that perfect for a range of different sites. This theme uses custom post types and has various widget areas. In the backend there are drag and drop menus for easy setup and maximum flexibility. Fejoia is an ultra minimalist theme with a two-tone design. This theme is ideal for bloggers with its focus on words rather than images. Hellish Simplicity is a simple, clean, and responsive design. Developer Ryan Hellyer originally developed this theme for his blog, but has made it available as a free download since 2008. It has undergone many iterations since then, but has mostly stayed true to its original design. Padhang is a Medium-esque minimalist theme focusing on content. This theme features a responsive layout and two widget areas in the footer. It’s easily customizable using the theme customizer that comes with WordPress. Padhang means “bright” in Javanesse. Tiny is another ultra minimalistic theme that puts the focus on clean typography. It is fast, SEO-friendly and features 11 different styles ideal for bloggers. Clean and retro, Madison has been designed for personal portfolios. Some of this theme’s features include a responsive design, a Nivo slider on the homepage, a work page with detailed information, Superfish dropdown menu, social links with icons and LESS files included. Doke Doke is a cute and clean parallax theme ideal for creative agencies and freelancers. It features a filterable portfolio. Min is a super minimalist and responsive theme with no bells and whistles. It has two widgetized footer areas to handle navigation or anything else you want to put there. Landscape is a clean, minimalist responsive theme ideal for photographers and bloggers. The focus is squarely on words with this theme, though it’s easy to change that focus with some beautiful images. Lexiity is a responsive under construction/coming soon/landing template featuring a count down timer. This theme’s features include white labelled theme administration, shortcode generator, color skins, MailChimp integration. It also comes with support. Balloons is a responsive parallax theme with a whimsical design. The colors are customizable and this theme integrates well with the WP-Pagenavi plugin. The front-end language can be easily switched between English and German. Pinzolo is a beautiful, clean theme with customization options in the WordPress theme customizer. This theme features a custom header image and featured image header on posts and pages, custom background and color, fixed menu, Ajax loading for blog posts. What's your favorite minimalist theme? Tell us in the comments below. This is also minimalist themes in information. Do you know you are compatible with multisite and translatable? Amazing selection here. If only they were available in Blogger. These are some nice and clean themes. Thanks for sharing! A couple other free and clean themes I have used are Customizr and Arcade Basic. Both are also built on the Bootstrap framework. Muchas gracias por compartir, excelentes temas! Thank you for this great overview I found by googling “WordPress minimal themes”. I found two perfect themes to use on my blogs and you introduced me to some great developers. Saved me a lot of time and money. Keep on shining, Raelene. Aww! Thanks! Glad to help.